Fiesta Friday #1 starts tomorrow, at 8 am. Everybody is encouraged to join. 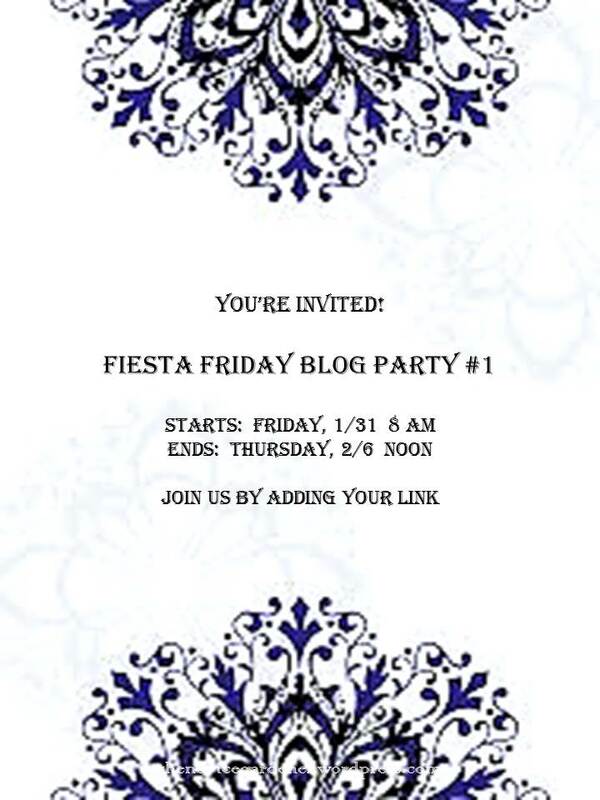 To learn how, go to Fiesta Friday Blog Party Guidelines. 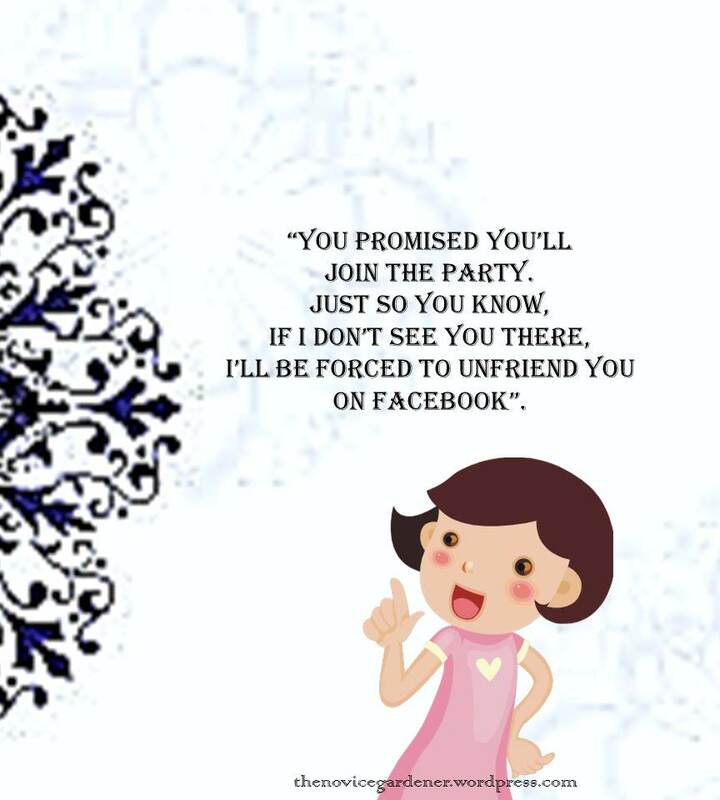 An even friendlier reminder for those who have “RSVPed”. My psychic prowess has reached a new level. Once again, I anticipated correctly the next Zero to Hero assignment. We are to set an editorial calendar for our blog, by adding a regular feature. Well, what do you know, Fiesta Friday will be a regular feature on The Novice Gardener. Maybe in the future I’ll add more regular features, such as Music of the Month, Weed of the Week, or Saturday Salad, something like that. But for now, Fiesta Friday will suffice. This Zero to Hero is coming to a close. Just one more day, one more assignment. It’s so, so sad there won’t be any more homework. I’ve gotten so used to multitasking because of it. Thank goodness there’s Fiesta Friday to look forward to. Zero to Hero participants, please join the party. I might suffer from post-Z2H withdrawal symptoms if I don’t see you again. It feels like being in a close-knit family going through the challenge with you, and it will be hard to see the family break up. They say you should mark your 100th post with something special. They say that. Who are they? I don’t know, they are them, the people who say you should mark the 100th post special. To mark my 100th post, however, I decided to do something else. If you’re participating in the Zero to Hero Challenge, then you’d know that challenge #22 was to create a post and submit it to a blog event. I’ve done this many times already, and I can tell you first hand that my viewership always spikes each time I do it, even more so if my post becomes a featured post. Obviously, this is an important task that you should not skip if you want to grow your views. But since I’ve already done this, multiple times, and since this is my 100th post, how about I kick it up a notch, Zero to Hero? How about I create the blog event? And have people submit their posts to me, instead? That’s an idea, anyway. Before I make it official, I would like to know first if any of my blogger buddies will be interested in joining the event or challenge or party, as I prefer to call it. ‘Cause what’s the point of having a party if nobody comes. I will call this blog party “Fiesta Friday.” Remember my Fondue Fiesta Friday post? Where I talked about finding ways to kick it up a notch to make thank-God-it’s-Friday days special? It’s the same idea. I would like for you to link up what you make or eat or do to mark the day special. 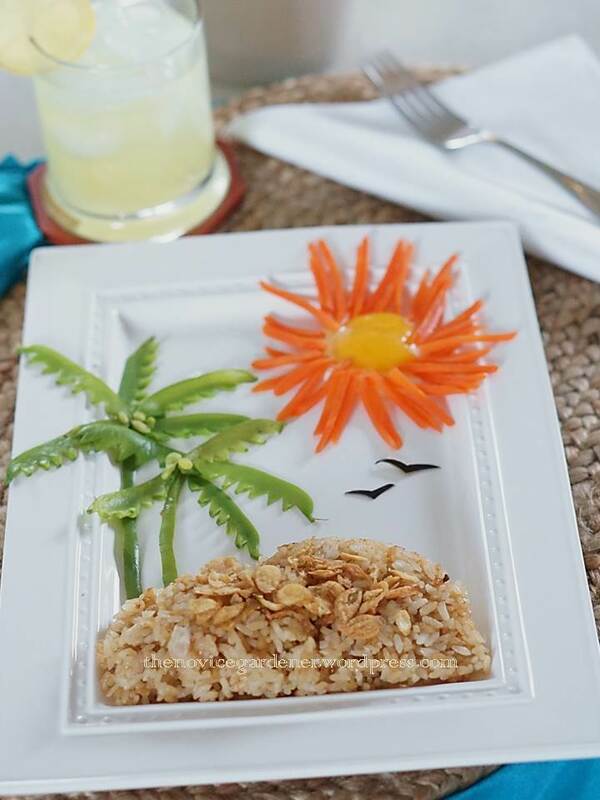 It could be a recipe or an activity or an idea. If you see an interesting movie or read a compelling book, talk about it and link that. If you decide to wear a particularly daring outfit to start your weekend on an upbeat mood, share a photo. Or maybe you would prefer to just tell us about the reactions you get from friends and co-workers. Maybe you have a joke or an uplifting quote to share, please do. As you can see, there is plenty of ways for you to join the party. Even though The Novice Gardener is mainly a “fooden” blog (food + garden, a portmanteau I created for my blog), my interests are varied and I appreciate all kinds of pretty and fun things and many forms of entertainment. So, what do you think, peeps? Are you interested? It’ll only happen if I get you on board. I’ll have to work out the details as to how and when links should be submitted, but first let me know what you think. Now, onto that pie. Did you know Thursday was the National Pie Day? 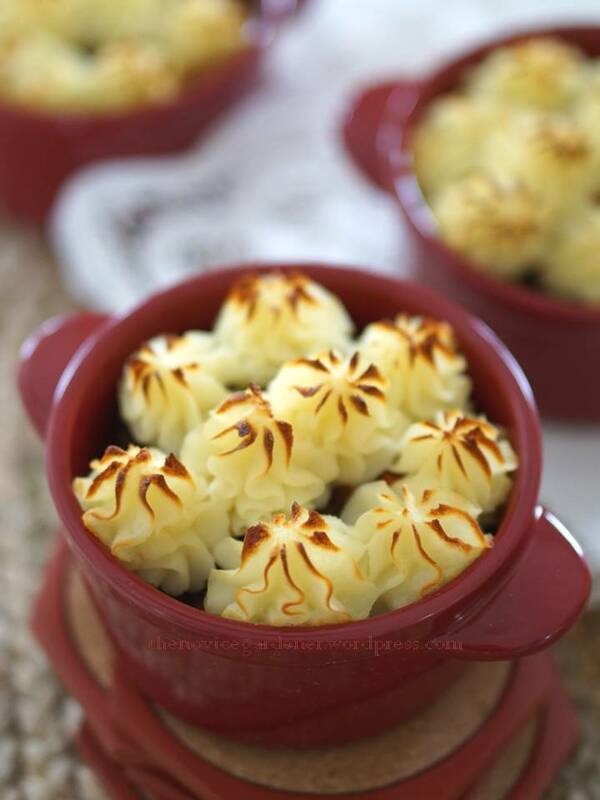 To mark the special day, I made shepherd’s pie, using my trusty old recipe, the one with tomato paste and Worcestershire sauce. It was very good, and the family devoured it. But since I’m doing a Fiesta Friday post and this being the 100th post and all that, and after talking it over with Johnny, I am presenting to you the kick-it-up-a-notch version. Now, tell me this wouldn’t have gotten your weekend started on a tasty note? Zero to Hero lucky day 21 for me. The challenge has us drafting a post, expanding on the new-to-you format post published for #19, where I talked about Bruno Mars in an aside. Well, Bruno is from Hawaii, and Hawaii is an island. And I’ve been island dreaming all day long. I’d say I’d fulfilled the assignment, don’t you think? The lucky part comes from the Weekly Writing Challenge that asks that we write a short post a la Frank O’Hara’s Lunch Poems. So, I’m killing two birds with one stone. One post for 2 challenges. Sometimes, you just get lucky. Ever noticed how some people are more interesting than others? Their mannerism, way of speaking, and even looks, set them apart. Let me give you an example. Gabriel Byrne and Pierce Brosnan. Both actors, both Irish, both dark and handsome. Yet one is definitely more interesting. Byrne. Right? C’mon, he has the reputation of being the “brooding” kind! That makes him interesting. More so than Brosnan. And this coming from a gal who had a crush on Remington Steele, too. Of course, Byrne is not as interesting as either Sean Connery or Colin Ferrell, both also dark and handsome Irish (See Update) actors. But it wouldn’t be fair to compare him to them. One is a legend, the other much too hip and young to warrant a fair comparison. Jennifer Aniston vs. Angelina Jolie. Jolie. Oprah Winfrey vs Gayle King. Winfrey. Okay, the last one is unfair. I’m pretty sure Gayle King is plenty interesting. We just haven’t been exposed to her as much. Besides, is there any woman who can be more interesting than Oprah Winfrey? Maybe Malala Yousafzai, and she is even just a kid. The point I’m trying to make is that some people just have what it takes while others don’t. To be interesting. I want to be like them. Not so much in the real world as in the blogosphere. I’m not saying the blogosphere can’t be real, but that’s another debate for another day. Anyway, that’s the kind of reputation I want to have. I want people to say,”Now that’s an interesting blog,” about my blog. That’s why I’m making this Scandalous Sandwich. All of a sudden, things have just gotten more interesting around here. Who wouldn’t be interested in a Scandalous Sandwich? Scandalous Sandwich is so darn interesting. Why scandalous? 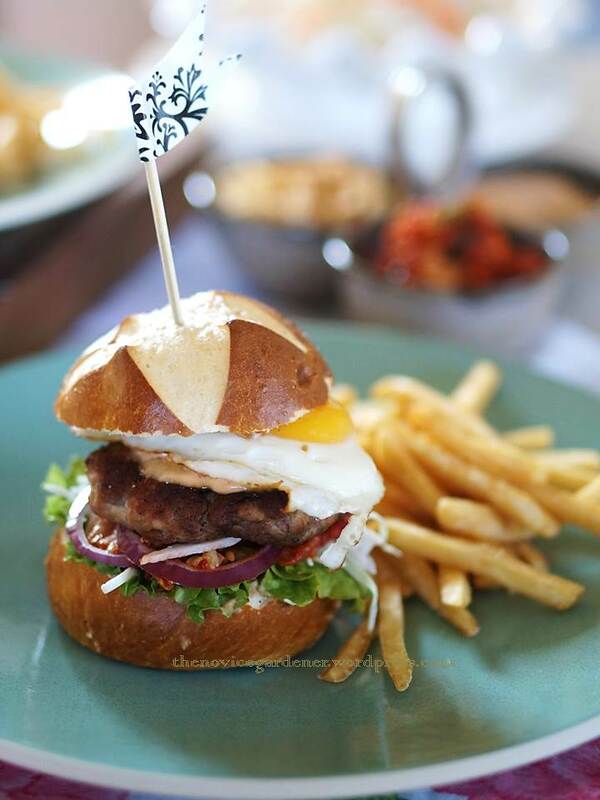 Well, have you ever had a burger sandwich with spicy kimchi and a sunny-side-up? Oh, you’ve been to Chicago’s BopNGrill and had their kimchi burger?